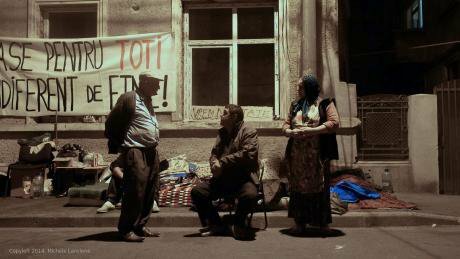 A community has been living on the streets for one year in protest against a racist and dysfunctional Romanian state that does not care about them or the thousands of others in their situation. People shortly after the eviction. Photo used with author's permission. Click to enlarge. Nicoleta is a hard-working 32-year-old woman. She has just given birth to her second son, Iosif, soon to be the playmate of his brother, 5-year-old Silviu. Their father is a young man who works every day for a local business. Together, they might resemble one of those families living in a spotless apartment, eating fancy food and smiling all day, like the ones portrayed on countless Bucharest street advertisements. However, they have no fancy food, no apartment and – apart from the arrival of the newborn baby – no reason to smile. Nicoleta is one of the 100 people evicted from their homes in a street called Vulturilor, near Bucharest’s city centre, on 15 September 2014. Since then, throughout a terribly hard winter and a tropical summer, half of these families have been dwelling on the street in front of their old homes. It is to that street that Nicoleta came back, once her minimum stay in hospital was over, and it is there that young Iosif will soon learn the harsh life of being a second-class citizen of present-day Romania. There are countless similar cases around the world (for a recent example in the UK, see Sophie Hemery’s account of Sweets Way Resists in London). Evictions take place because housing is no longer a staple entitlement (if ever it was), but the upshot of bargains struck on technocratic markets where a click of a mouse moves assets and displaces people more easily than chips on the green baize table. But things get even more complicated than this in Romania. Although the country did not suffer anything like the housing crisis of the US, Ireland or Spain, and it does not have any major liability posing a potential threat to the housing security of its citizens (as in the case of Greece), evictions are nonetheless a daily occurrence (on this, see Amnesty International and AlJazeera). What makes the situation in Romania so particular is that the vast majority of these evictions affect people like Nicoleta and her family: nice, clean, hard-working Roma people. The fact that Roma people are discriminated against in Romania is no novelty. They were held in slavery for roughly 500 years (from the fifteenth century until 1856), and their marginalised life continued during ‘communist’ times as well. The latter is particularly interesting in terms of understanding today’s evictions. As part of the ‘systematization’ program of Ceaușescu, which involved the demolition of ‘insalubrious’ settlements on the edges of major cities and the incorporation of small villages into new cities, hundreds of thousands of people were displaced from 1974 onwards. In Bucharest, Roma people living in informal settlements were mostly relocated into ‘nationalised’ houses, namely houses that, before 1950, belonged to private owners and were thereafter appropriated by the state. Those houses were 19th-century buildings that had barely seen any restoration for decades and were thus less attractive as homes for the average Romanian citizen, who was moving into newly built blocks instead. Although the re-location of Roma people into these decaying buildings was coherent with their overall marginalisation during the Communist years, things got even worse when the regime collapsed. After 1989, the Eastern bloc countries rushed into promoting legislation on the restitution – to their original owners – of nationalised properties. This was not the case in Romania. Although measures were adopted for agricultural and industrial estates, none was put in place for nationalised houses (which estimates put at more than 200,000 buildings). The first action came in 1995, and it was not about restitution, but consisted in allowing residents to buy the homes they were living in. Not surprisingly, few Roma people had sufficient financial resources to buy their homes, so the vast majority continued to rent from the state. The scenario changed in 2001 when the Romanian Government passed Act 10/2001. This law allows the owner of a nationalised building to apply for its restitution by the state în natură, meaning that there is no financial compensation from the state, but a transfer of property rights instead. The only safetynet that Act 10/2001 provides for the tenants living in a returned building is a 5-year period of grace during which they can still live in their homes, paying rent to the new/old owner of the estate. After those five years, the tenants are supposed to find a new home on the private market, and the new/old owner is free to do whatever s/he likes with the property. What usually happens is that the owner does not sign a new lease with the current tenants, but prefers to sell the property to an investor. At that point, the tenants lose any legal rights to remain on the premises and eventually get evicted onto the street. The ‘restitution’ act (retrocedarilor, in Romanian) has arguably been designed to protect the interest of owners and investors without providing any feasible protection for tenants. The reason why such protection should have been provided is rooted in the history sketched out above: by 2001, the only people still living in nationalised houses were mainly poor families that could not afford to rent on the private market (this is why the 5-years grace period post-pones the problem, rather than solving it). The most striking point is that the state knew – or had every means to know – about this situation because almost all the families living in nationalised housing at that time had already filed applications for social housing (which is however a sheer illusion since Romania has not invested in building new public housing for decades). If you add to this the fact that Act 10/2001 gave rise to ‘mafia retrocedarilor’, as it is known, consisting in bribes to public officials, faked documentation, dummy owners and speculation on property values, the suspicion that the state has not protected, but exploited its most vulnerable citizens is more than legitimate. It is within this complex web of historical legacy, paradoxical laws, corruption, neoliberalism and racism that a case like that of Nicoleta and her family needs to be seen. On 15 September 2014, more than 20 families were evicted from a street named Vulturilor. The eviction came as the final upshot of a process that began in 2002, when the property was ‘retrocedata’ to its original owner. By 2007, after the 5-year ‘grace’ period during which the tenants paid rent to the old/new owner, the latter had sold the land and the litigation rights to a consultancy firm managed by a Norwegian citizen. The camp during winter. Photo used with author's permission. Click to enlarge. From then until last September, nothing happened: although the new owner won the right to evict the people in 2008, he did not do so and did not start work on any development in the area. Whether this lack of intervention was due to his decision to grant the people some time to re-locate – as he claimed during an interview with me – or whether it was due to the concurrent global financial crisis is of secondary importance. 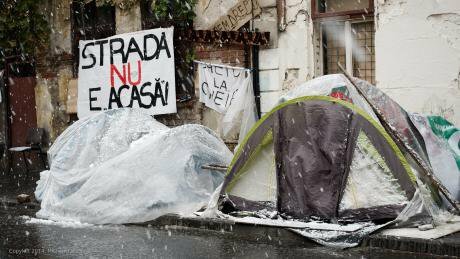 What is noteworthy is that, between 2007 and 2014, the local authorities – meaning both the local district (Sector 3) and the municipality of Bucharest – did nothing to find a viable alternative for the 100 people living at number 50, Vulturilor street. Instead, the only offers after the eviction had taken place were of six months' financial help to rent on the private market or re-location to shelters for homeless people (women and children in one place, men in another). Refusing these ‘options’ – which were unacceptable for people who had had a home up to that point and were entitled to social housing – the Vulturilor’s community did something highly unusual in the Romanian context: they started a massive protest to claim their housing rights. With the initial assistance of local NGOs and activist groups, the people of Vulturilor have dwelt on the street in front of their homes for one year, first using tents and then moving into improvised shacks. They have protested peacefully and with dignity, through public marches, events, demonstrations, the day-to-day occupation of the pavement in front of their former homes, and public interviews. Their stories have also been collected in an on-line blog, which documents the developments over this last year in videos and a written account that speak to the many in their situation in Romania. These include the numerous evicted Roma people in Bucharest's Rahova-Uranus neighbourhood (whose story is told in the fine stage show, La Harneala), the evicted Roma people in Cluj and their re-location near a chemical dump, those in Eforie (near the city of Costanza) and many others. The state is mostly keeping silent and ignoring these cases. Suffice it to consider that the embassies of Austria, Denmark, Finland, France, Germany, Great Britain, Netherlands, Norway, Spain, Sweden, Switzerland and the U.S.A wrote a letter to the mayor of Sector 3 asking for clarification on the Vulturilor eviction, copying it to the Romanian Ministry of Foreign Affairs. The letter was sent roughly three weeks after the eviction took place, on 7 October 2014. These twelve embassies received nothing but a vague response, one of them told me, and not until 4 February 2015: four months after their request. Meanwhile, Romanian citizens have been living on the street for one year, and many others will experience homelessness very soon. The Vulturilor people have become sick, poorer and weaker on the street. Their children have learnt how to take an improvised shower using buckets, to change in chemical toilets, and to go to school wearing clothes washed by hand out in the street. Their parents have lost hope and become worn down, trying to fill in all the countless documents that their state continuously asks them to submit in a spiral of Kafkian bureaucracy and inefficiency. Meanwhile, the Romanian authorities keep on promising that new social housing is under construction, although the only new buildings that are due to open in Bucharest are expensive hotels and huge cathedrals. Assessing the blame resting on those institutions at the international level is the only way to end discrimination in Romania, to win justice for the forceful protest by the people of Vulturilor and to hold out a different future for Iosif and children like him. Note: You can learn more about the story of Vulturilor at the community’s blog: www.jurnaldinvulturilor50.org. To provide help you can contact the Frontul Comun Pentru Drept la Locuire (http://fcdl.ro/), the NGO Carusel (www.carusel.org) or Active Watch (http://www.activewatch.ro/). The views expressed in this article are those of its author only.